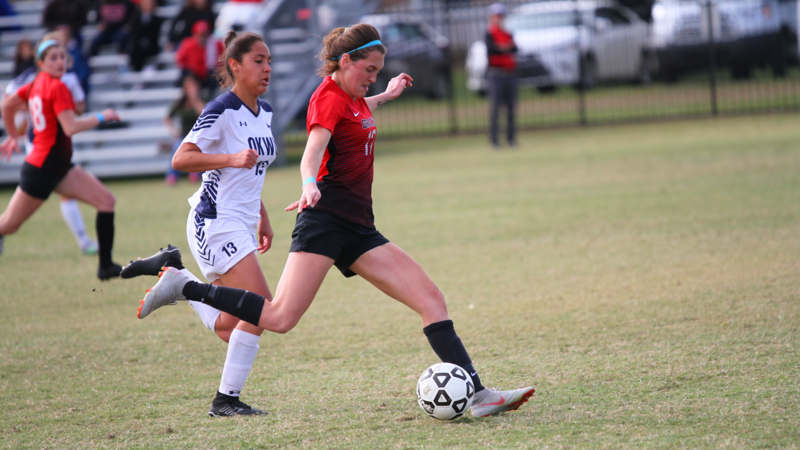 Grace College women’s soccer team’s remarkable 2018 season came to an end on Thursday with a 1-1 tie versus Oklahoma Wesleyan. The Lady Lancers were eliminated despite not losing a game in pool play; the Eagles won the group via tiebreaker, owning a better goal differential by one than Grace over the three matches. Grace wraps up the season with a 20-4-1 record, marking the first time in team history to reach 20 victories. The Lady Lancers also qualified for NAIA Nationals for the second time and will end the season ranked in the NAIA Top 25. The Lady Lancers seemed to have the upper hand for much of the first half. Grace had two strong early chances, pining for a quick goal. Clair Snodgrass and Jenni Phillips each had a shot on goal that was saved in the first five minutes. Grace kept the Eagles (16-5-2) pinned back for much of the first half, looking for holes to exploit. Corinne Villalobos also had a few chances that missed, including a header. The Lady Lancers eventually broke through with a goal in the 18th minute. Liz Van Wormer sent in a corner kick to the far post, and Anna Kuhl rose up and headed her shot into the net. Oklahoma Wesleyan managed to tie the game in the 34th minute, a goal which proved costly. The Eagles scored off a scrum in the box, knocking in a loose ball which Grace failed to clear. OWU seemed to regroup after scoring its goal, which helped to level the run of play. Grace had a few more chances to score again in the half, including an attempt from Sacia Hanson that went hight and a saved shot by Fort. Cassidy Wasson almost scored Grace’s second goal late in the half. She tried a 25-yard blast that beat the goalkeeper but clanged off the crossbar. Grace went into halftime tied 1-1 despite an 11-3 advantage in shots. The second half was more evenly played than the first half. Both teams missed on opportunities to score. Wasson and Bellinger each tried two shots in the second half, and Hanson had an attempt saved. Phillips seemingly found the game winner in the second half. She received a pass inside the box and sliced her shot into the back of the net, but the official judged her to be offside. Bethany Blackwood made a trio of sharp saves in the second half to keep Grace’s hopes alive. But neither side was able to find a winner in regulation. In the overtime periods, the Eagles did well to absorb Grace’s pressure. OWU knew that even a tie would advance the team to the championship game, which put the pressure on the Lady Lancers. In the final overtime session, Grace put numbers forward in pursuit of a late winner. The Lady Lancers pressed until the final seconds when Kuhl’s last-second shot from a distance was saved. Villalobos had five shots and three on goal, and Phillips and Hanson each shot four times.